With Autumn in full swing, it's time to up the anti on your skin care routine. Summer leaves the skin generally in a comprimized state of sun damage, dryness & further dehydration which can lead to sensitivity. At Bella Spazio we recommend for your skin a O2 Lift Oxygenating Facial combined with Microdermabrasion. This treatment is "A Breath of Fresh Air for the Skin". Deeply exfolliating, illuminating, oxygenating, lightening, hydrating, elimanates toxins & increases circulation of the skin. Personally a 02 Oxy/Micro Treatment is my favourite after over 30 years of performing results driven facials, this is a stand out performer. This one hour treatment is action packed to address numerous skin conditions. it is suitable for all skin types but is just perfect for a pre wedding facial or Mother of the Bride. 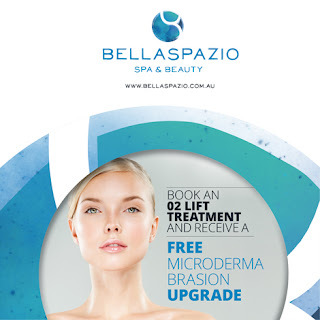 Bella Spazio skin experts invite you to come in during April & receive a FREE Skin Medical Scope to evaluate your deeper layer of skin cells. When booking a 02 Lift Oxygenating Facial in April you will receive a FREE Microdermabrasion in your treatment.